This server has received 2229264 hits from both ipv4 and ipv6. 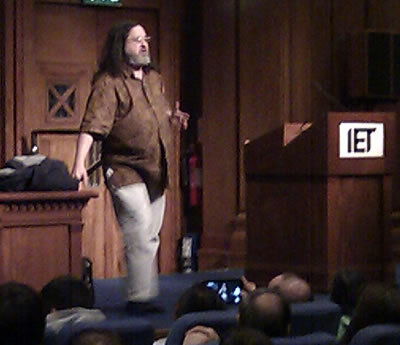 Looking like an aging hippy or perhaps a beer festival aficionado Richard Stallman, free software crusader, struck an unusual figure at the grand and venerable Institution of Engineering & Technology last night. “we’ve got to legalise all kinds of sharing on the Internet “; “Cloud is nebulous and should not be used. Same for software as a service”; “you shouldn’t do something unethical because if not, someone else will do it “; ” Facebook is not your friend, I don’t want my data to be misused. They also use Flash. You shouldn’t trust it”; “Amazon’s lists of books bought is an infringement of human rights”; “Picket the Apple store”. It’s safe to say the world is already a different place thanks to his early work on GNU and the GPL licence. Making citizens value their freedom over convenience is now the focus of Richard’s work. 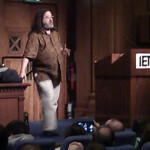 Richard Stallman launched the development of the GNU operating system in 1984. GNU is free software: everyone has the freedom to copy it and redistribute it, as well as to make changes either large or small. The GNU/Linux system, basically the GNU operating system with Linux added, is used on tens of millions of computers today. The GNU GPL licence is used in thousands of software programs and guarantees the freedom of anyone using it to view, modify and share the source code. Another key aim of the act was to remove the monopoly and censorship that had previously been present. The original law limited the copyright to just 14 years which in today’s digital age seems perhaps a better value than the 70 years post death of the current system. Perhaps reducing the duration of copyright will encourage people to create more content?